Some religious people think evolutionary theories are flawed because scientists often admit that they were wrong about an old explanation when a new explanation comes along. The theories keep evolving. Folks can see evolving truths as a sign of weakness. They seem to assume truths must always be unchanging. Others see the admission that understanding of truth can change as a sign of strength. Science is more of a process of learning and changing, rather than a set of absolute principles or dogmas. In the 1930s, vacuum tubes were considered orthodoxy for amplification devices. Then along came the transistor. If scientists of the 1930s were like religious fundamentalists, we would still be using vacuum tubes. Understanding of truth, in science is always changing and that can be seen as a virtue rather than a weakness. Scientists are often more humble than fundamentalist religious people. They are willing to admit that their answers are open to scrutiny and modification is possible. 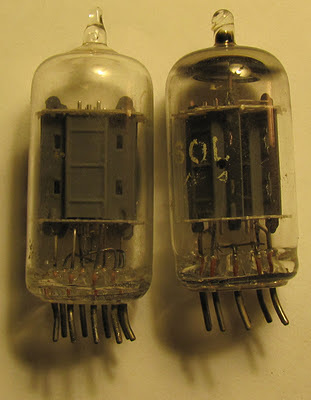 Some folks still claim vacuum tubes sound better in amplifiers than solid state components. Especially for electric guitars. Interesting that electric guitars often hold onto tube technology when rock music was once thought of as "cutting edge rebellion." Then there is spin as in advertising. What is actually "better." When I was a kid in the 1960s, there was an encyclopidia article about how transistors were better than vaccuum tubes. My dad read that article to me as I sat on his lap. Maybe I was in second grade then. "Is that true, or is that just a commercial?" Couldn't figure out why that question made my dad crack up laughing.